Industrialized in the 19th century, the St. Alban district in Basel, Switzerland, still feels oddly like a mountain village, thanks to the steep topography, the dense foliage, and a canal that flows between modest vernacular buildings. "You're maybe 300 feet from the Rhine and close to the old city center," Andreas Bründ­ler says. "But because of the natural landscape, you might think it's the middle of nowhere." That context is what informed Buchner Bründler Architekten's renovation and expansion of a youth hostel, the Jugendherberge Basel. Its long and narrow building began life, circa 1850, as a factory that produced silk ribbon for clothing. When the factory was re­purposed as a hostel in the 1980's, the historic interior was gutted. Only the vaulted dye cellar, a few steps below the ground level, remained in a setting that Bründler calls "very '80's-with a lot of ceramic tile and metal framing." The Schweizerischen Stiftung für Sozialtourismus, which owns and oversees hostels in Switzerland, was looking not only to add rooms but also to increase their variety. All that while sticking to a tight budget and making sure that everything was youth-proof, built to last. So Bründler and Daniel Buchner balanced more tightly packed guest floors with open, intercommunicating public spaces. The architects also built an extension at one end. Guests used to enter at the opposite end. As Bründler recalls, "You went in through a nasty, shadowy part." 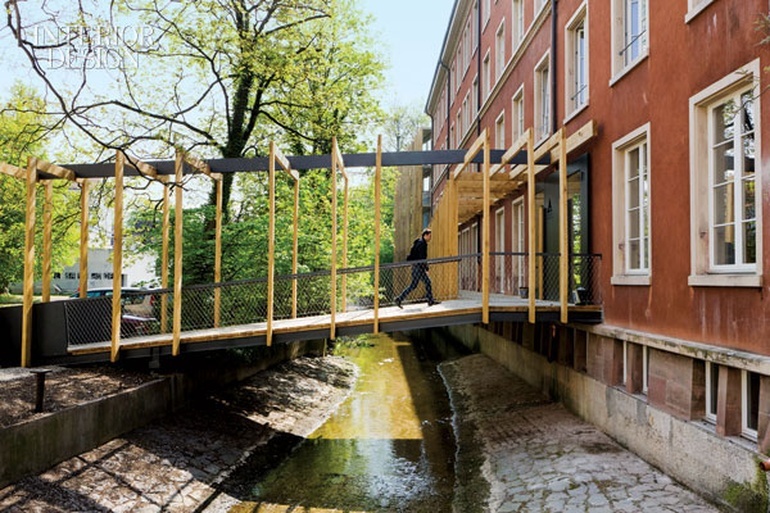 A light-as-air entry footbridge now spans the canal along one side of the building. "Most people walk along the Rhine, then come up and approach from that direction," Buchner says. The bridge then deposits them directly in reception. Buchner Bründler used the long poured-concrete reception station as a rough dividing line. It separates back-of-house areas, including a conference room, from the vast majority of the ground level, a?loftlike lobby. Because it can, admittedly, be austere, the architects added playful graphics by the elevator and stairs to indicate the different functions on the five levels. Removing a wall connected the lobby, visually and actually, to the old dye cellar, now a sunken dining room. "You have the whole generosity of the building, fully open from end to end," Buchner says. The cellar's vaulted ceiling adds to the appealingly monastic quality of the oak refectory tables lined with black Arne Jacobsen chairs. To increase capacity, Buchner Bründler gutted and rethought the three upper levels. The number of guest rooms went up 20 percent, to 69 rooms or a total of 244 beds. It's a mixture. Six-bed bunk rooms are for youths; four-bed rooms are for families. Though the accommodations are small, turning the space between the door and the sleeping quarters into an anteroom, equipped with a sink, introduces a sense of progression. These washing or dressing areas are enclosed with white-tinted marine plywood. "A rather inexpensive material that will patinate over time," Buchner offers. And it exudes a Spartan modernity that's surprisingly welcoming. Glass-box modernism rules the extension-a contrast to the inward-looking factory. This new construction brought the square footage to 10,200 and enabled the hostel to provide some outdoor space. A porch, sheltered by an overhang, is open to all, while private balconies extend from some of the extension's 21 "minimalistic luxury rooms," as Bründler calls them. Definition? Spectacular views through floor-to-ceiling windows, bigger beds, and a full bathroom. "It's a youth hostel," Bründler says, "but an old person wouldn't mind it."